There's no better choice than Acers for fiery autumn foliage colour and interest that's guaranteed to make an impact. The stunning foliage changes colour throughout the year, producing an amazing show in autumn before the leaves drop. Perfect for shady spots, specimen plants in pots around the patio or in the border to add height and year-round interest. Easy to grow and fully hardy – even in the coldest of winters. Acer palmatum 'Atropurpureum' Deep burgundy-purple leaves that turn an even more brilliant shade of bright red in Autumn, just before they fall. The classic red-leaved maple. Acer palmatum 'Butterfly': A fantastic variety with lacy, fine foliage. Its leaves are grey green and beautifully marginned with cream tinged with pink.. It forms a 3m bush in 20 years. A must have for any garden! Acer 'Orange Dream': Bright orange new growth, which fades to yellow in the autumn. It is a great specimen shrub that grows to 3m over 20 years. Supplied in 10.5cm pot - 1 each of 3 varieties, approx 20cm tall, and well-branched. Note, photos show plants as supplied in early autumn. Foliage colour varies throughout the year and branches are bare during winter. Plants enjoy regular watering and a sheltered position to keep the leaves at their best. Leaf colour is best in partial shade, although full sun can be tolerated as long as the plants are well watered. When positioning your acers, avoid exposed places as leaves can suffer with wind-burn (scorch), especially if the plants are dry. 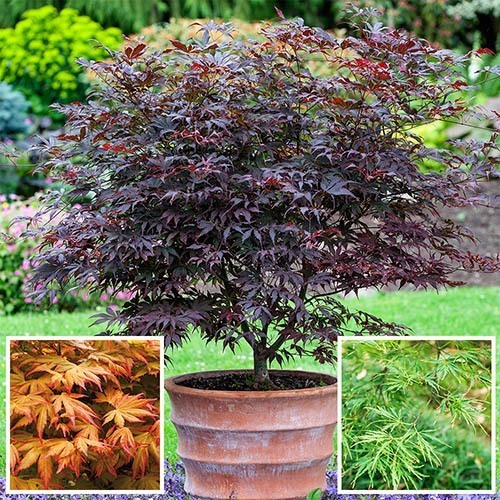 Allow your Japanese Maples to get used to a whole day in the sun by starting them off in the shade, then standing it in their final sunny spot (in pot or in the garden soil) for one hour longer every day for a week. If planting in the garden, prepare a wide hole and loosen the soil with a fork, incorporating organic matter as needed to improve moisture retention and condition. Plant your Acer palmatums so that the top of the root ball is just slightly below ground level.